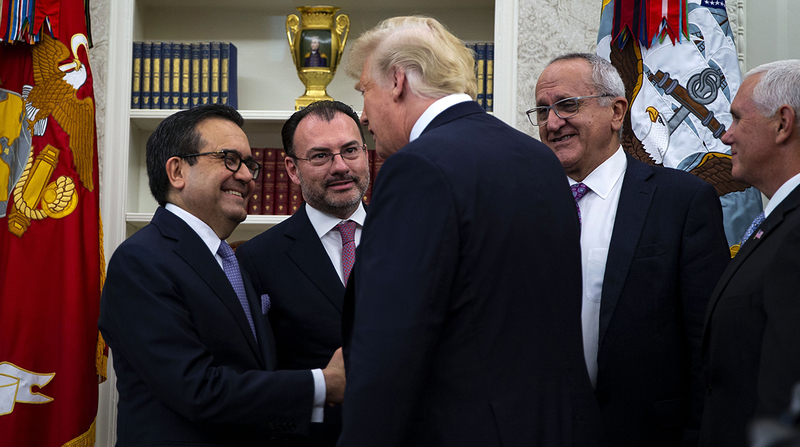 A new trade agreement between the United States and Mexico contains a provision that could boost cross-border package delivery, ratchets up pressure on manufacturers to source more products domestically and may lead to more restrictions on Mexican trucks operating in the United States, according to early assessments from business and industry officials. Trucking leaders reacted cautiously to the news with many waiting to see if Canada becomes a party to a deal that is intended to replace the North American Free Trade Agreement. Spear and other business leaders have warned against making drastic changes to NAFTA that would disrupt the flow of freight between the United States and its largest trading partners. Trucks carry nearly 70% of the value of freight moving across the border with Mexico and nearly 60% of the value of freight moving across the border with Canada, according to U.S. Department of Transportation estimates. Total two-way trade with Mexico was $557.6 billion in 2017. President Donald Trump announced on Aug. 27 that an agreement in principle had been reached with Mexico and gave Canada until Aug. 31 to negotiate a similar pact. But on that day, the U.S. announced negotiations with Canada will resume Sept. 5 after four days of intense discussions in Washington ended without a deal. A key provision in the agreement, intended to shrink the trade deficit between the United States and Mexico, is a requirement that vehicles shipped to the United States have 75% of the value of their parts come from suppliers in North America, up from the current level of 62.5%. Other provisions set “rules of origin” standards for chemicals, products made from steel, glass and optical fiber, plus the agreement limits the use of textiles from sources outside of North America for clothing produced in Mexico. Cindy Sebrell, vice president of the Motor & Equipment Manufacturers Association, a trade group representing truck equipment manufacturers, said she is concerned about the possibility of a cap on motor vehicle parts exports to the United States. “This may serve to decrease American manufacturing jobs and exports and put U.S. businesses at a global disadvantage — all while increasing costs to consumers,” Sebrell said. The agreement also contains stronger protections for intellectual property rights and sets new rules for digital trade. Mexico agreed to raise its de minimis shipment value level, or the value at which a product becomes subject to customs duties or taxes, from $50 to $100. The change will make it easier for companies and individuals in the United States to sell goods in Mexico. A chapter on labor includes a provision committing Mexico to take action to provide for effective recognition of the right to collective bargaining. It also prohibits the importation of goods produced by forced labor and requires that between 40% and 45% of auto content be made by workers earning at least $16 an hour. Mexican auto workers typically make less than $8 an hour and even less at parts plants, according to the Center for Automotive Research. While providing incentives to source goods and materials in the United States and North America, the agreement does nothing directly to disrupt Mexico’s extensive network of maquiladoras along the northern border with the United States. A maquiladora is a factory in Mexico that operates under preferential tariff programs administered by the United States and Mexico. Materials, components and production equipment used in maquiladoras are allowed to enter Mexico duty-free and products made can be exported into the United States at lower tariffs than those from other countries. Under the Maquiladora Program, which began in 1964, factories can be 100% foreign owned. There could be changes, however, in a program that allows a limited number of Mexican trucks to operate in the United States beyond border zones, according to several industry sources. The issue was first raised in 2017 when NAFTA talks began, at the urging of the Teamsters union and others who claimed that allowing Mexican drivers to operate in the United States would compromise safety and take jobs from U.S. drivers. Teamsters General President James Hoffa issued a statement in which he urged the administration to continue with reforms to the trucking provisions in NAFTA. “We believe that the administration has taken real steps to deal with our concerns,” he said. Tom VanMouwerik, president of Bill Hay International, a freight forwarding firm that specializes in cross-border shipments, said he’s happy to see new trade deals getting done.